Tottenham vs Dortmund is a game that counts for the first hand of the Champions League eights, which has a scheduled start whistle at 22:00, and will fight against Wembley. Tottenham is one of the most important teams of English football, which has grown a lot in recent years, starting to have serious claims both in domestic competitions and in Europe. The London group is currently ranked third in the Premier League, five points in the first place, occupied by Manchester City, which also has an extra match. Pochettino’s lead was a decent one, starting weak enough, ending well, being also helped by Inter Milan, who got involved in the last round. Spurs finished second in a group with Barcelona, ​​PSV Eindhoven and Inter Milan, thus reaching the optimum of the Champions League for the third time. The hosts of this game are on an upward slope, being in good shape, coming after three consecutive wins, all on their own, winning Watford, Newcastle and Leicester. Tottenham has some notable players, including Dele Alli, Kane and Lamela. 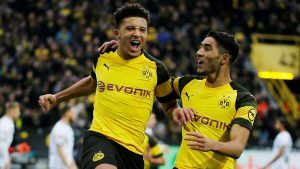 Dortmund is one of the top teams in German football, which is doing well in this season, being the first in the Bundesliga standings, five points over Bayern Munich’s rivals, having a good chance to get the first title after a quite a long break. The “Yellow-Blacks” also shined in the Champions League, with very good evolutions in a group with Atletico Madrid, Club Brugge and AS Monaco, finishing in the first position. Unlike his opponent, the team coached by Lucien Favre is in a weak form, given that he comes after three unsuccessful matches, in Frankfurt, Hoffenheim and Werder Bremen. It is worth mentioning that the Borussians have received not less than six goals in the last two games, which is worth just as much. Reus, Paco Alcacer and Piszczek will be missing from the guests, all being injured while Weigl is flu, so he will not play either. Tottenham and Dortmund are two of Europe’s most spectacular teams, so we expect this to prove this, so, starting from the premise that we will be seeing a multiplayer game, we are counting on will award many corners.